Winter is upon us, and Christmas is around the corner (can I say that? ), so I couldn't resist preparing a snowman art project for Little Dude. The little guy hasn't seen real snow yet, but does understand what a snowman is. Besides, they are so cute! 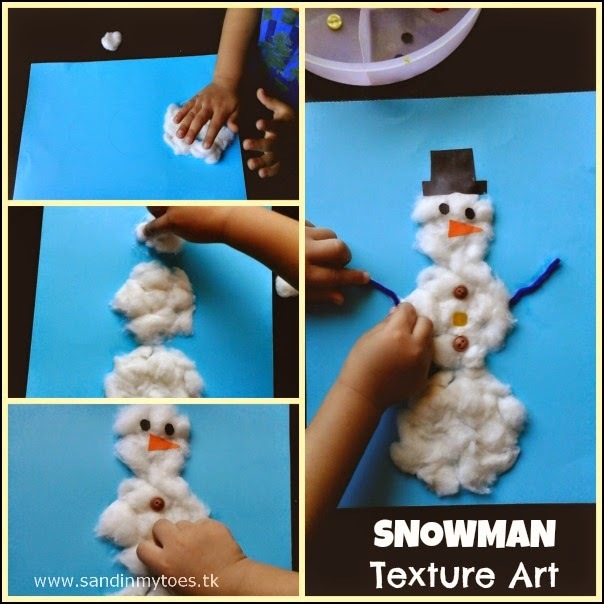 For this simple Snowman Texture Art project, I tried to give him a variety of materials to create different textures. It gives the snowman a 3D-like effect and really makes the finished artwork pop out. 1. Use the blue card as a base and draw three circles for the snowman with a pencil. 2. 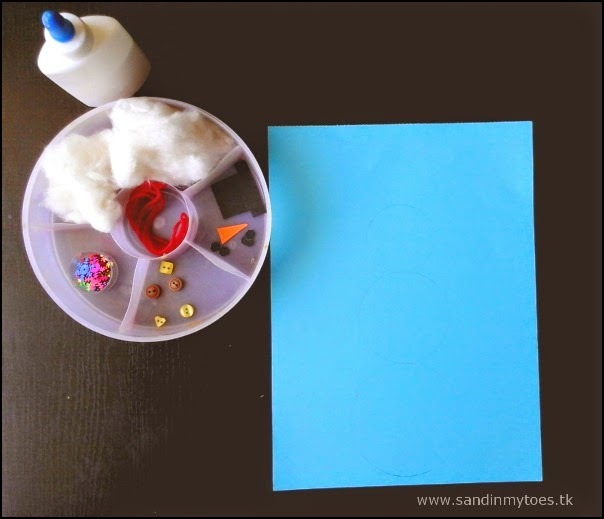 Apply glue to each circle and stick on the cotton wool. 3. Cut out two circles for the snowman's eyes with the black card, and a triangle for the nose with the orange card. Paper may not stick on as well on cotton, but you can try thick paper. Stick them on in place. 4. Stick on the buttons. An assortment of buttons looks better. 5. We used blue pipe cleaner for the arms. You can also use yarn for this. 6. We cut out a hat from the black card, and stuck it on. 7. Then, I folded the red yarn a couple of times, and helped Little Dude stick it on as a scarf for the snowman. 8. We had some snowflake glitter, so I let him stick it around the snowman. This was probably the most fun part for Little Dude! I had initially planned on using more cotton to make snow, but this looks pretty nice. 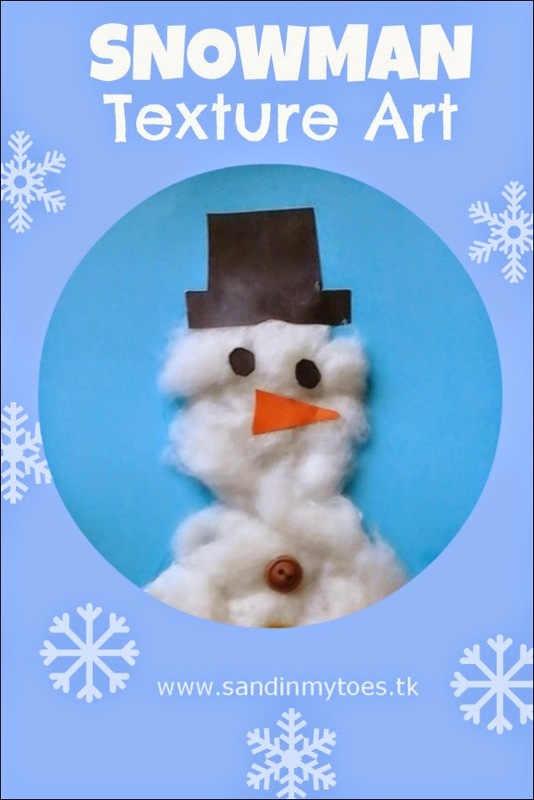 Making this textured snowman art was a fun activity, and can also be used to make pretty greeting cards. Oh, I really like that and so easy to do too! Thank you, hope your cards turn out great! 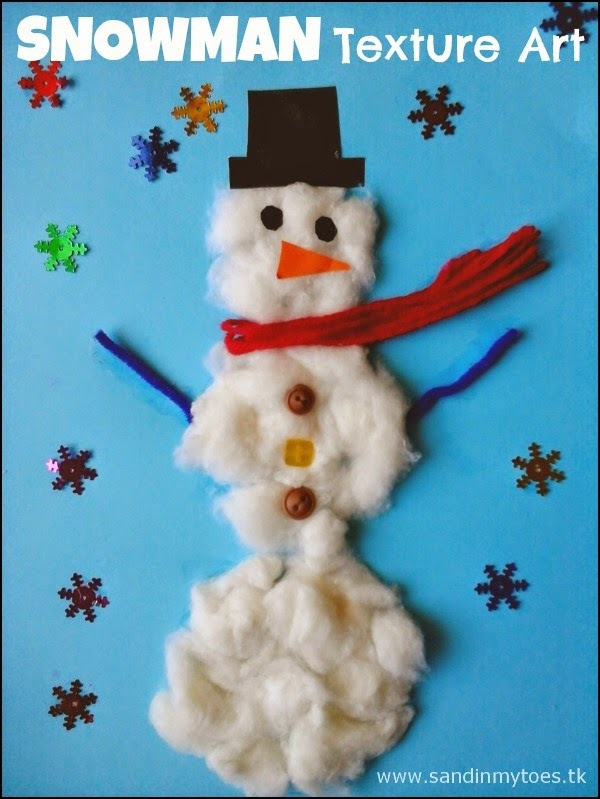 Lovely picture and a great way to have fun with snowman art. I love textured pictures. Thank you for naming him! Lucas says - Little Due - this is AWESOME!!! The best snowman art I've seen in ages. You deserve XL MEGA High-5's for this!! Six things my toddler learned from Peppa Pig!